Ever wake up with a crazy idea about how to do some good in this world? Troy Jessee did! Troy didn’t just wake up with the idea – he jumped out of bed and called Habitat to say he was ready to turn his dream into a reality. Troy has been actively engaged with Habitat through his church, Trinity Baptist Church, for the past 23+ years. They have sponsored house builds, team building days and everything in between. 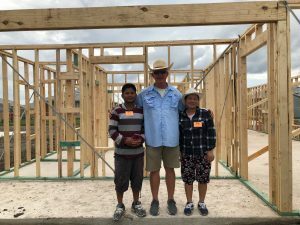 Troy, a craftsman by trade who owns Troy Jessee Construction, is always the first one on site to help frame up Trinity Baptist’shouses. He has always showed great passion for the work he does with Habitat and loves how Habitat’s mission is rooted in Christian values. And so it was done. He started his Big Swim campaign in earnest with his friends, business acquaintances and family in early September. He emailed, called, texted, met and Facebooked everyone he knew asking for them to give a gift to Habitat in celebration of his swim. And how was his Big Swim you wonder? He aced it! Troy swam the 3.5 miles of open water in 2 hours and 5 minutes! He was an absolute rock star. He was happy to be greatly blessed by the weather. The water was like a sheet of glass and no jelly fish or sharks came to visit him. Thanks to all of his family and friends Troy raised just shy of $90,000! Starting February 16th, he’ll be building a home with a hardworking family in need. Check out our Facebook page (@HabitatforHumanityofSanAntonio) for more information on the dedication on April 13th at 10am. Way to go Troy for making your dream to help a family in need come true! You certainly are answering their dreams of homeownership. Watch Troy’s Big Swim Video Here!